Since it's almost December now, all stores have their winter collection in. When I was browsing around in the New Look and H&M I saw there where a lot of animal printed jumpers and also online you can find hundreds of them! They are sooo amazingly cute and of course really comfy! And some of them even have a little Christmas-y touch. I absolutely love them. They will keep you warm all winter long without looking unfashionable. 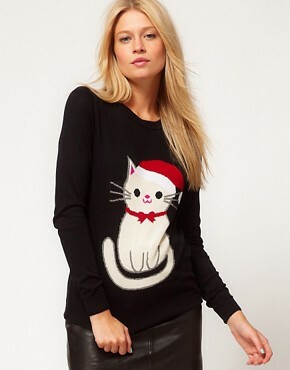 This jumper is sooo adorable! With the cat and the Christmas hat! I absolutely love it! It's a great Christmas jumper, but I would ware it the whole winter true. I absolutely love this purple color! Great for a little pop of color during the winter time. What is your favorite jumper? :) I love them ALL! I think I might even pick up one soon!